Made in 1952, this British war film looks at the story of an RAF fighter pilot Pilot Officer ‘Septic’ Baird (played by John Gregson) who joins a unit during the height of the Battle of Britain. It’s a fairly simple story of how Baird enters the squadron, resented by many of his other officers like his commander Group Captain ‘Tiger’ Small (Jack Hawkins) and Squadron Leader Peter Moon (Michael Denison) and he is grounded but he soon proves his mettle. Visually director O’Ferrall brings the battles with the Luftwaffe to life with style and aplomb and British war film staples like Gregson and Hawkins lend a certain amount of class to proceedings. Angels One Five, named after the altitude the planes reach, is a celebration of the bravery of the pilots during the Battle of Britain and comes complete with a melancholy ending. It is a little bit corny but it is well-made and well-acted and this restored version is good-looking, reissued to commemorate the 75th anniversary of the Battle of Britain. 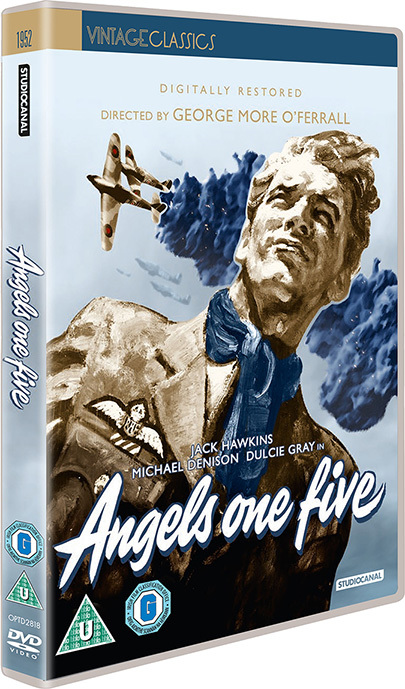 While it’s never going to be an absolute classic, Angels One Five is a worthy addition to the library of any aficionado of British war films.